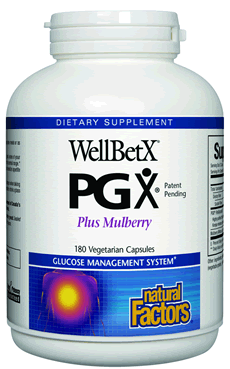 Natural Factors WellBetX PGX Soluble Fiber Blend contains glucomannan, which acts as a bulking agent in the stomach and intestine, so you feel fuller and eat less. It also manages glucose and cholesterol levels by lowering sugar and fat absorption rates. PGX® is a completely unique blend of highly purified soluble fibers processed using advanced proprietary technology. Compared to other soluble fibers, significantly less PGX is required to obtain the same important health benefits including glucose balance, appetite control and reduced food cravings. Other Ingredients: Vegetarian capsule (modified cellulose, purified water, silica), magnesium stearate (vegetable grade), rice powder. 2-4 capsules taken with 8-16 fl. oz. of water, 5 to 10 minutes before meals or as directed by a health professional. 1. Effect of glucomannan on plasma lipid and glucose concentrations, body weight, and blood pressure: systematic review and meta-analysis. 2. Effect of glucomannan on obese patients: a clinical study. 3. Glucomannan and obesity: a critical review. 4. Effect of mulberry (Morus indica L.) therapy on plasma and erythrocyte membrane lipids in patients with type 2 diabetes. 82. J Am Coll Nutr. 2008 Feb;27(1):102-8. 83. Altern Ther Health Med. 2005;11(6):30-4. 84. Altern Med Rev. 2010 Apr;15(1):68-75. 85. Nutr Hosp. 2004 Jan-Feb;19(1):45-50. 86. Am J Clin Nutr. 2008 Oct;88(4):1167-75. 87. Nutr Metab Cardiovasc Dis. 2005 Jun;15(3):174-80. 88. Eur J Clin Nutr. 2006 Apr;60(4):529-37. 89. J Am Coll Nutr. 2003 Feb;22(1):36-42. 90. Diabetes Care. 2000 Jan;23(1):9-14. 91. Diabetes Res Clin Pract. 2009 Feb;83(2):e40-2. 92. J Med Assoc Thai. 2007 Oct;90(10):2150-7.